It doesn’t seem possible to be able to use the words ‘chainsaw‘ and ‘art’ in the same sentence. The chainsaw is such a workmanlike and crude tool that it is always surprising to me what beautiful carvings can be made within a couple of hours with the right kind of wood and a noisy, sawdust spitting, dangerous chainsaw. 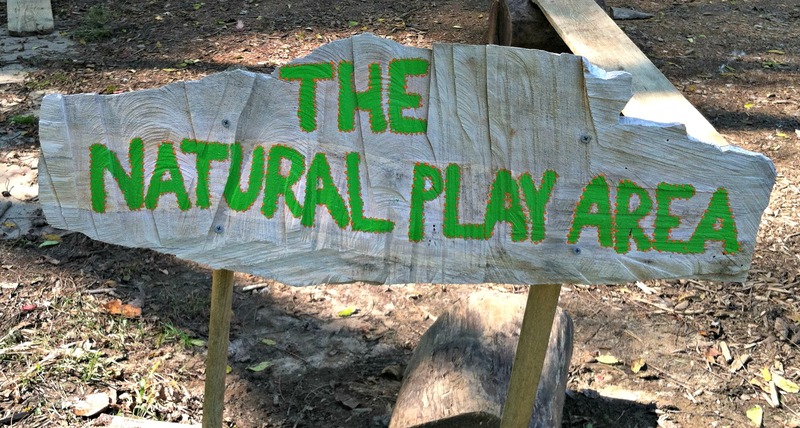 But when I visited Oregon Ridge Nature Center recently, my eyes were opened to the possibilities, as soon as I saw the new play area that was designed with all chain saw creations by Pat Hundley, a local chainsaw artist. 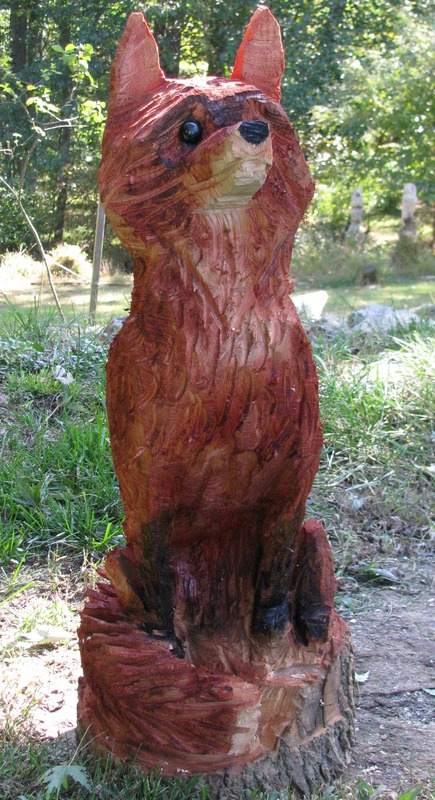 These chainsaw creations are perfect to decorate your garden or outdoor space and will last for years. You can get one to hold up your mailbox, embrace a sign, use as a play set for kids, or just for decoration. 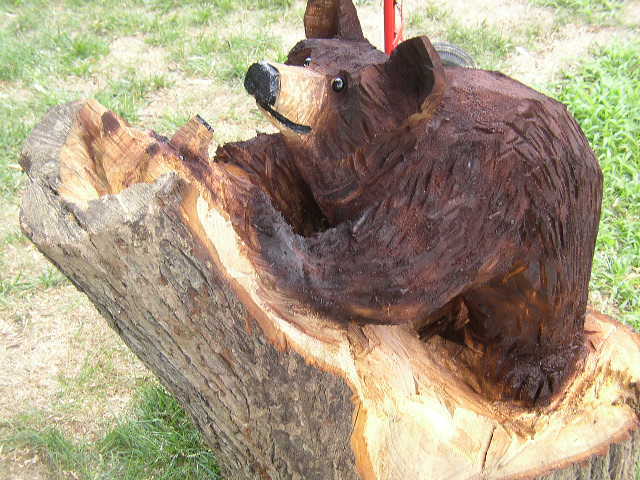 Chainsaw art has become very popular, especially in timber heavy areas of the country. 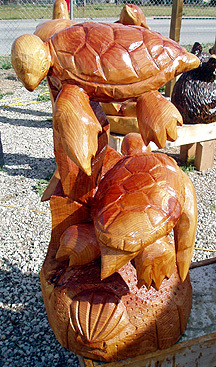 In western Maryland, Deep Creek Lake is chock full of chainsaw artists on every corner, advertising their masterpieces. There is even a new TV show called Chainsaw Gang, which features premier chainsaw artists from around the country who battle each other to deliver incredible works of art. 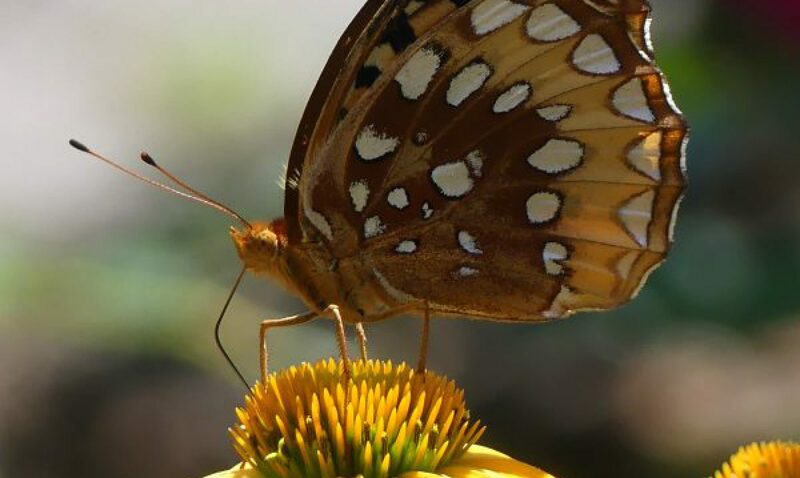 I talked with Pat Hundley, who has a day job as a teacher for Baltimore County Schools, about how he got started in this unusual hobby. He said that he got started after Baltimore Gas & Electric did some tree trimming at his house and left some logs behind. Pat got the idea of carving a bear out of one as a surprise for his wife. An hour later, he created a bear coming out of a log and he hasn’t stopped since. Pat says it takes about an hour to do a bear and he will charge around $100 for the piece, depending on the complexity. The carving can last for years if you seal it at least twice a year with deck sealant and/or polyurethane. He paints some of the pieces also to make the details pop. Pine is the primary wood that he carves in as it is readily accessible in MD, but he uses anything that becomes available. Pat is friendly with some tree removal professionals to obtain the materials that he needs. 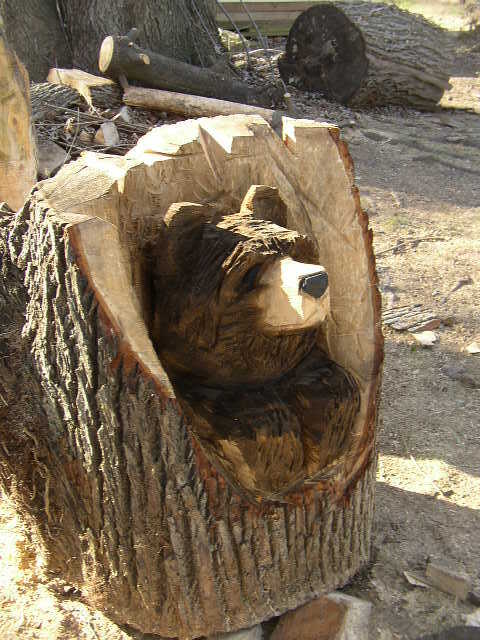 The most popular design that Pat does is the bear emerging from a log and I can see how that one would fit right into my garden! Pat sells his creations at local craft shows and by word of mouth. There are special tools of the trade to make the detailed carvings come to life. Pat uses guide bars or carving bars called ‘quarter tip’ and ‘dime tip’, that have very small ‘noses’ that allow finer cuts for details such as fur and feathers. The important advantage of these special bars is that they do not produce ‘kickback’ when using them, and are much safer than the standard bars. In order to reach the high levels of skill required to be a “chainsaw carver“, a good amount of instruction and practice is required in the safe operation of a chainsaw. This is then followed by plenty of study and practice in carving basic shapes which then ultimately leads on to more ambitious projects. It is extremely important that anyone using a chainsaw wear the proper protective clothing, like leather chaps and ear protection. A cut from a chainsaw is not just a cut, it can actually remove a chunk of flesh and bone. 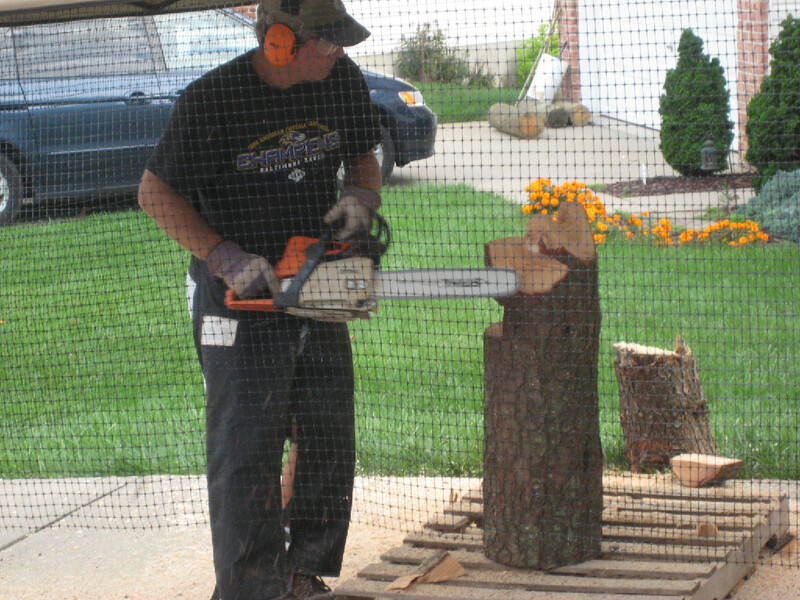 Chainsaw art is a relative recent art form dating back to the 1950’s. Not only is it seen as a sculpture, but also as performance art or spectacle – with the noise, flying sawdust, and very fast carving results. It is stunning how fast the carving comes to life, as opposed to old-fashioned carving using mallets and gouges that can take much longer. Also, the detail that you can achieve with chainsaws amazes me. I was also delighted at the number of women who make a living out of chainsaw art. There is even a group called ‘Chainsaw Chix’ which is the first group of all-female sculptors. Go Girls! Chainsaw art is not limited to the United States either. There are international artists all over and competitions all around the world. There is even a chainsaw carving school in Toei, Japan. Now, I just need to find that perfect spot in my garden to showcase one of these pieces of art! 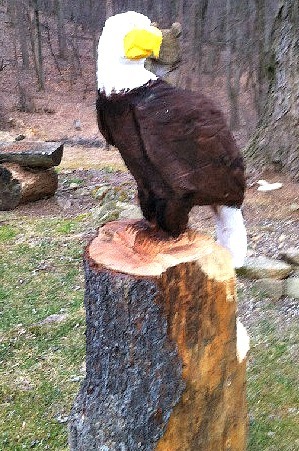 My mom is looking for someone to carve an eagle out of a tree she has at her house. If interested please contact me at 301 746 5145. Or the email I provided. I would like to know how much you would charge for it and if you would be interested in coming to seeas the tree and hear her idea for the eagle. You would need to contact the chainsaw artist directly.